Limited Edition of 75 copies on BLUE Wax with Black Marble - Limited quantities available, so hurry up! 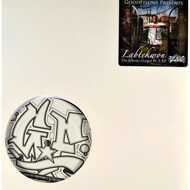 Re-Issue of 1993 Random Tracks by legendary Baltimore MC Labtekwon. Featuring 3 of the best tracks from the rare original Release and 3 previously unavailable on vinyl songs from the same era, all remastered!